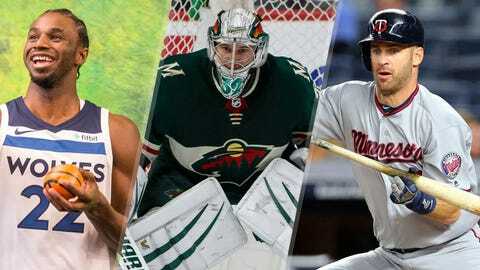 Check out the best snapshots from the past week of Minnesota sports! 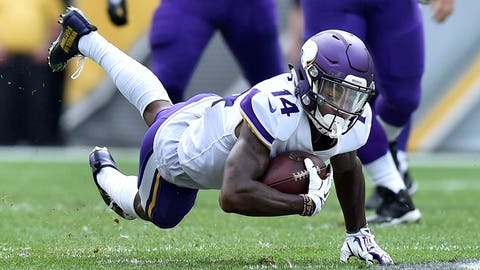 Sunday, Sept. 17: Minnesota Vikings receiver Stefon Diggs dives ahead for a couple extra yards during the Vikings’ 26-9 loss to the Pittsburgh Steelers. Sunday, Sept. 17: After Eddie Rosario went yard, Minnesota Twins centerfielder Byron Buxton followed it up with a solo shot of his own to right field. 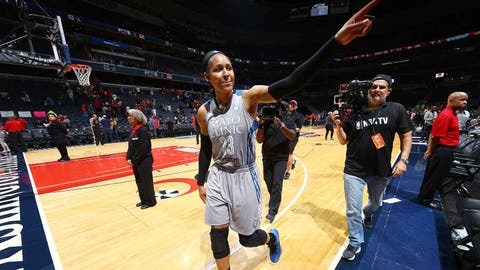 Sunday, Sept. 17: Minnesota Lynx star Maya Moore points to fans in the crowd after the Lynx clinched a trip to the WNBA Finals, sweeping the Washington Mystics in three games. Monday, Sept. 18: Ryan Malone celebrates his goal in a shootout with Minnesota Wild teammates on the bench. The Wild topped Winnipeg 3-2 in a shootout. Tuesday, Sept. 19: Minnesota Twins first baseman Joe Mauer bunts for a single against the New York Yankees during the first inning at Yankee Stadium. Thursday, Sept. 21: Eduardo Escobar celebrates scoring a run during the Minnesota Twins' 12-1 rout of the Detroit Tigers. 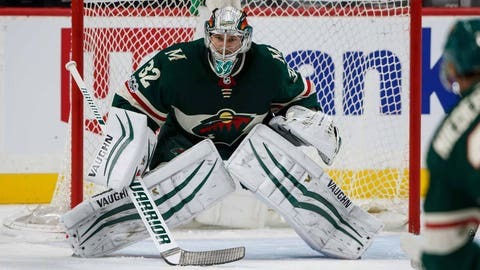 Thursday, Sept. 21: Minnesota Wild goaltender Alex Stalock stopped all 21 shots he faced in a 1-0 preseason shutout of the Winnipeg Jets. 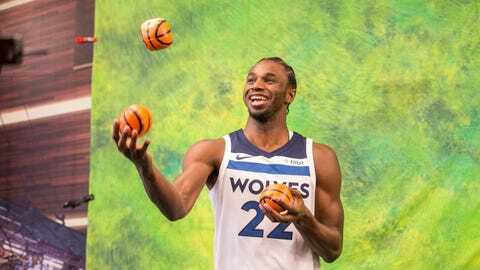 Friday, Sept. 22: Minnesota Timberwolves forward Andrew Wiggins juggles tiny basketballs at media day at Mayo Clinic Square in Minneapolis. Friday, Sept. 22: Minnesota Twins second baseman Brian Dozier dives in safe at home in the fifth inning against the Detroit Tigers at Comerica Park in Detroit. 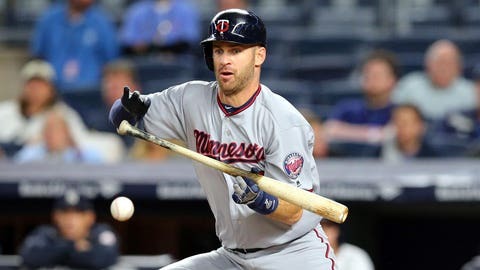 The Twins won 7-3. 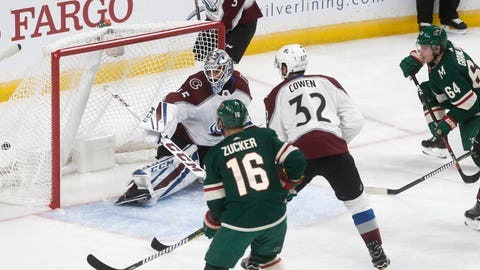 Saturday, Sept. 23: The Minnesota Wild's Mikael Granlund (top right) scores a power play goal off Colorado Avalanche goalie Jonathan Bernier during the first period of a preseason game in St. Paul, Minn. The Wild won 2-1. 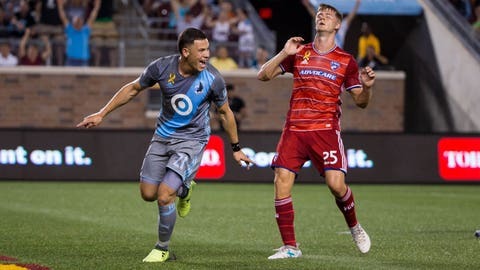 Saturday, Sept. 23: Minnesota United forward Christian Ramirez celebrates his goal in the first half in front of the FC Dallas defender Walker Zimmerman at TCF Bank Stadium. Ramirez had a goal and two assists and the Loons won 4-1.